Dr Crawford opened by explaining that X-rays were a form of light which resided outside the visible part of the electromagnetic spectrum, having wavelengths of hundreds to thousands of times shorter than those of visible light, between 10 and 0.005 nm. Their existence had been known about since 1895, when Wilhelm Rëntgen, a German physicist, had discovered that some cathode ray tubes emitted an unfamiliar kind of radiation, to which he had given the name X-rays, using the mathematical notation x to indicate something unknown. Rëntgen had gone on to pioneer the medical applications of X-rays for which they were still best known today. The speaker explained, however, that the way in which X-rays were used in medicine differed from how astronomers studied them in one important respect. Almost invariably, astronomers looking at the X-ray sky were interested in the objects which were emitting the X-rays; in medicine, by contrast, well understood X-ray sources were used, and it was the absorption of their X-rays by bone which was interesting. Dr Crawford went on to explain that the appearance of the sky in X-rays was profoundly different from the familiar view seen in visible light. This could be understood by considering the kinds of sources which produced visible light and X-rays. Most of the visible light in the Universe emanated from hot objects such as the surfaces of stars, which glowed red-hot at temperatures of a few thousand degrees, or planets and nebulae which reflected light from nearby stars. To emit at X-ray wavelengths, objects had to be much hotter than this, reaching temperatures of tens of millions of degrees, found only in the most violent of astronomical environments. However, such environments did exist. The prime examples were the neighbourhoods of black holes and neutron stars. Compact objects such as these often attracted a flow of gravitationally-captured matter from their surroundings, which was compressed to high densities and elevated to tremendous temperatures by friction as it was funnelled down onto their tiny central cores. Other examples included shock fronts and blast waves, such as were found around the remnants of historic supernova explosions, and in places where massive stars produced powerful solar winds which collided with the interstellar medium. The speaker went on to illustrate these ideas by comparing corresponding images of the familiar area of sky around the constellation of Orion, as seen in visible light and X-rays (see Fig. 1). In the visible light image, the most brilliant object was the Moon, lying in Taurus, but it was hardly distinct at all in X-rays. Dr Crawford explained that though the Moon did reflect solar X-rays, the Sun was not an especially bright source of them. The neutron star at the centre of the Crab Nebula (M1) was, by contrast, one of the brightest objects in the X-ray image, despite its meagre sixteenth-magnitude optical appearance. The stars of Orion's belt and the Orion Nebula (M42) were bright in both images: these were young stars, and their strong solar winds produced powerful shock fronts around the stars, where they collided with interstellar gas. Neither Rigel nor Betelgeuse were visible in X-rays: these were old and relatively tranquil stars. A curious case was that of Sirius, which was visible in both images, despite being an old star. Dr Crawford explained that a compact eighth-magnitude white dwarf star, Sirius B, orbited around its better-known companion at a distance of 3–11", and although the white dwarf was almost invisible at optical wavelengths against the glare of Sirius, it was almost entirely responsible for the pair's X-ray brightness. [Figure 1: The constellation of Orion, as seen in X-rays (left) and visible light (right). The Moon is visible in the top-centre of the optical image. Turning to discuss the practicalities of observing in X-rays, the speaker explained that the Earth's atmosphere was highly absorbent at X-ray wavelengths – a good thing for life on Earth, given the propensity of X-rays for causing cell mutations – and so it was necessary to observe from altitudes of at least 80 km. The earliest X-ray telescopes, flown soon after the end of the Second World War, had used balloons and German V2 rockets to reach such altitudes, and had identified the Sun as a source of weak X-ray emission. More recently, a series of space-based observatories had been flown, including Einstein (NASA, 1978–1981), ROSAT (ESA, 1990–1999) and ASCA (Japanese, 1993–2000). Two were currently operational: Chandra (NASA, 1999–) – the X-ray counterpart of the Hubble Space Telescope in NASA's Great Observatories programme – and XMM-Newton (ESA, 1999–). Getting above the Earth's atmosphere, however, was not the only challenge of X-ray astronomy. Conventional mirrors could not be used to focus such short-wavelength light. To understand this, it was useful to think of X-rays as particles, photons, rather than as waves. At these short wavelengths, each photon of X-ray light carried so much energy that it could be compared to a bullet. Conventional telescope mirrors tended to absorb them in preference to reflecting them. However, just as bullets could be made to ricochet off surfaces at shallow angles of incidence, so too could X-rays. By designing a telescope where light could be brought to a focus whilst only ever grazing mirrors at shallow angles, it was possible to focus even X-rays. This meant, however, that each mirror could only collect light from a very small area of aperture, since it was turned almost edge-on to the incoming radiation, and so, in practice, many concentric ring-shaped mirrors with a common focus were nested within one another to build up an adequate collecting area (see Fig. 2). [Figure 2: Schematic diagram of the optics of Chandra. The primary and secondary reflective surfaces are orientated in concentric rings, such that X-rays make grazing incidences with them. The need to minimise the deflection of the X-rays by the mirrors gave rise to another problem: the focal lengths of these telescopes needed to be long. Chandra had an aperture diameter of 1.2 m and a focal length of 10 m; meanwhile XMM-Newton's three separate telescopes had a maximum aperture diameter of 70 cm and focal length of 7.5 m. These giant optical systems were at the limit of what it was physically possible to launch into space, and it was likely that future telescopes would be launched into space piecewise and assembled in orbit. Dr Crawford then turned to review how a variety of objects appeared in X-rays. The Sun had been the first astronomical source of X-rays to be discovered, although it was in fact a comparatively weak source. Its face, being at a temperature of only a few thousand degrees, did not produce X-rays at all. The solar corona, especially around active regions of the Sun's surface, reached much higher temperatures than the surface itself, because of its continual bombardment by the solar wind, and was entirely responsible for the few X-rays that the Sun did emit. Likewise, most other middle-aged stars produced a meagre display of X-rays. Turning to the Orion Nebula (M42), the speaker remarked that the diffuse nebulosity for which it was best known in optical images was absent from X-ray images. This was produced by gas and dust at temperatures of only a few hundreds of degrees. But the Trapezium star cluster – the central cluster of hot young stars embedded in the nebulosity in optical images – was clearly apparent in X-rays. The solar winds produced by these young stars were strong enough to shock the surrounding gas such that it became a much stronger source of X-rays than the Sun's corona. Turning to another, nearer star-forming region, and zooming in to show how a single young star appeared, the speaker showed an image of DG Tau – a star of similar mass to the Sun, but only a million years old. It was thought to still be in the process of contracting and collapsing to form a main-sequence star. Two X-ray-bright jets were clearly visible on either side of the central source, each extending to about 700 AU from the central star. The speaker remarked that the more distant of the two jets appeared anomalously faint and explained that this seemed to provide evidence for the presence of a proto-planetary disc, or proplyd, of solid material around the star, absorbing the X-rays from the jet behind it. This disc might in time evolve into a solar system of planets like our own, and the speaker remarked that if, as was widely believed, all young stars went through a phase of being prodigious sources of X-rays, it was intriguing to consider what effect that might have on young solar systems. X-rays were also produced by supernova remnants, and these appeared as more extended sources than young stars. In the case of the remnant of Tycho's Supernova (see Fig. 3), which exploded in 1572, a circular bubble of X-ray emission could be seen, and the speaker explained that this appeared to be emanating from the material which had been thrown out into space by the supernova explosion. The fact that this material was still, 430 years after the explosion, producing X-rays was evidence that it still remained at a temperature of tens of millions of degrees. The emission had a mossy texture, which the speaker explained to show that the gas was highly turbulent. Around the sharply defined outer edge of the bubble could be seen a narrow line of high-energy X-ray emission, where the blast wave from the supernova explosion was still expanding outwards into the interstellar medium around it. The speaker showed images of other supernova remnants, including the Crab Nebula (M1), which had exploded in 1054, and Cassiopeia A, which had exploded around 300 years ago but seemed not to have been observed at the time. These showed similar X-ray morphologies, and the speaker explained that these images formed a useful evolutionary sequence: it would be a long wait before any one of these supernova remnants aged appreciably, but by comparing them, some grasp of their life cycle could be obtained. [Figure 3: The remnant of SN 1572 (Tycho's supernova) as seen by Chandra. 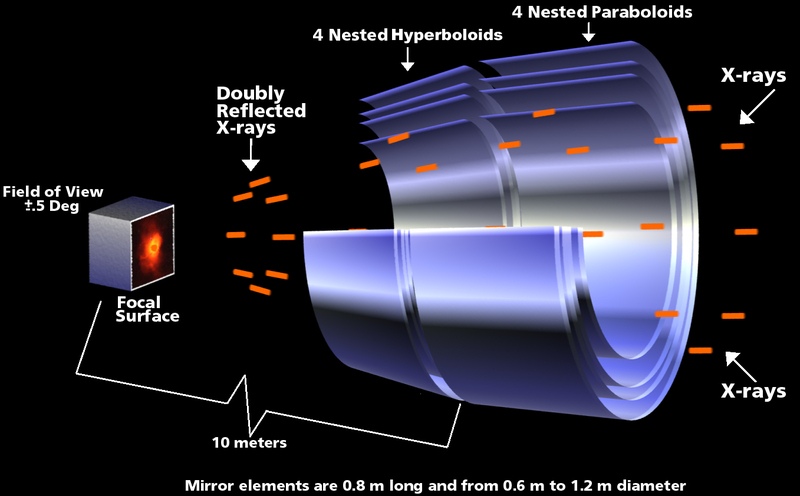 Low-energy X-rays are shown in red, and high-energy X-rays are shown in blue. In the centre, a bubble of mottled low-energy emission arises from hot debris from the supernova explosion. Around this, there is a thin shell of much higher energy X-ray emission, 20 light-years (9 arc-minutes) across, attributed to the shock front where the blast wave from the supernova hits the interstellar medium. Dr Crawford added, however, that in recent months a supernova remnant by the name of G1.9+0.3 had made headlines1 because a pair of images taken in 1985 and 2007 had revealed compelling evidence for its evolution over the intervening years. A comparison of the two images showed that its shock wave had been perceptably larger in 2005 as compared to 1982; it seemed to have expanded noticeably between the observations. From this, the remnant was inferred to be a very young object, and by calculating the rate of the observed expansion, it was possible to conclude with confidence that the supernova was expanding outwards at a rate of 5% of the speed of light, and had exploded around 140 years ago. The lack of 19th century observations of this supernova going off could probably be explained by its location, close to the centre of our galaxy. The amount of gas and dust along our line of sight to the remnant's core was likely to have hidden even an object as bright as a supernova from view. The speaker went on to remark that at the centre of each of the supernova remnants shown could be seen a bright point source of X-rays, marking the position of the dense neutron star which had been left behind by the core of the star which had undergone the supernova explosion. In the case of the Crab Nebula (M1), the neutron star was sufficiently close that Chandra could resolve detail in its accretion disc (see Fig. 4) and show the jets emerging from its two poles. It appeared rather similar to the proplyds already mentioned, but this time much more violent. [Figure 4: The pulsar at the centre of the Crab Nebula (M1), as seen by Chandra. The accretion disc is clearly visible, measuring around 2 pc across. Jets are seen to emerge from the disc's poles. Moving on to larger objects – collections of stars – Dr Crawford showed a series of images of nearby globular clusters, remarking that although a few point sources could be seen in X-rays, far fewer stars were visible than in optical light. These clusters were old – there was no ongoing star formation in them – and as old stars did not produce many X-rays, it was only old compact objects such as neutron stars – deceased members of the cluster – which could be seen in the X-ray image. This made the X-ray view of globular clusters highly complimentary to the optical view: it showed the population of stars which were no longer shining in visible light. Images of nearby spiral galaxies such as the Andromeda Galaxy (M31) and the Whirlpool Galaxy (M51) likewise showed the distribution of neutron stars through each galaxy, revealing a dense conglomeration of them close to each galactic centre, with the remainder of the population spread along the spiral arms. The nebulae in these galaxies were invisible, and the young stars within these sites of ongoing star formation comparatively faint. However, a faint hazy puddle of X-ray emission was apparent around the centre of each galaxy, which the speaker attributed to hot gas given off by numerous past supernova explosions in each galaxy's bulge. Much brighter sources of X-rays were galaxies which had active galactic nuclei (AGNs) – black holes of several million times the mass of the Sun accompanied by similarly huge accretion discs – at their centres: Centaurus A (NGC 5128) was a prime example. To close, Dr Crawford explained that the puddles of X-ray emission seen around the centres of galaxies were not the only diffuse X-ray sources. Around the galaxy clusters in Virgo and Coma, puddles measuring nearly 3° across could be seen, and other, more distant, galaxy clusters were accompanied by similar, smaller halos. The familiar optical images of these clusters revealed that they typically contained hundreds to thousands of galaxies, spread over tens of millions of light years, but the X-ray emission showed that there was also some smooth distribution of material in between the galaxies – an intergalactic medium. The significance of its X-ray emission was that for the first time, the amount of gas lying in the vast spaces between galaxies could be estimated, and surprisingly, it seemed that there was ten times as much invisible gas between galaxies as there was within them. This gas was understood to have reached temperatures of tens of millions of degrees in the process of falling in towards the immense gravitational attraction of the galaxy cluster, and hence to have become a source of X-rays. Following the applause, the President invited Mr Guy Hurst to present this month's Sky Notes.